LUXE Play Yard for TWO! AVAILABLE IN CONTINENTAL USA ONLY. The Romp & Roost Play Yard is one over-sized play yard, large enough for up to TWO children to play together or to learn crawling and walking skills in a safe environment. The cushioned mattress provides comfort while babies play or sleep. 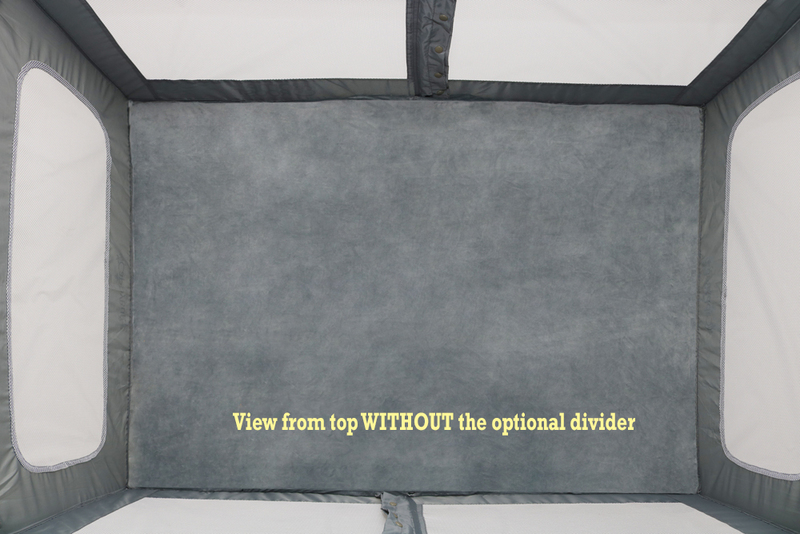 An OPTIONAL waterproof sheet can be purchased separately with or without a removable divider. 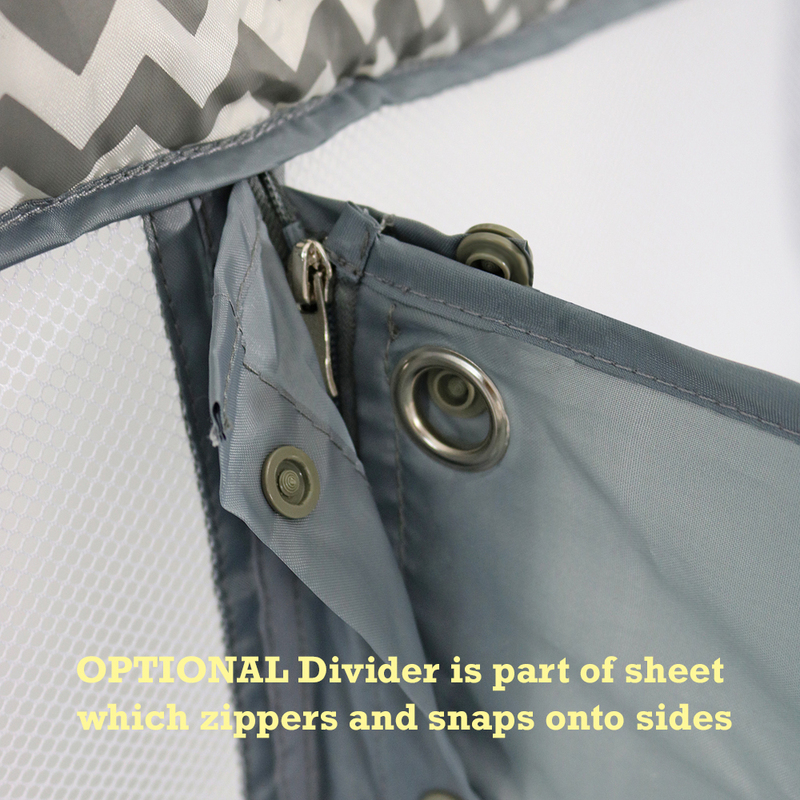 The waterproof fitted sheet with the divider easily attaches to the sides of the base unit with a zipper and sturdy snaps, making it versatile to adapt to your specific needs. 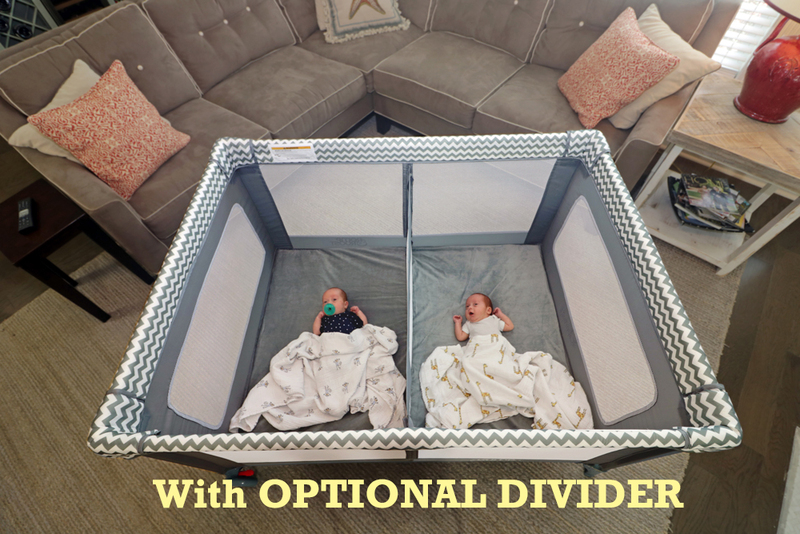 When using the divider, the play yard converts to sleep two infants or toddlers in their own personal space. Machine washable, too! Please note: The divider is intended for use until your little ones are able to pull up on it. At this time, our recommendation is to remove the divider for playing and put the divider back in for sleeping. The meshed walls and divider make the play yard completely breathable. Four sturdy wheels make it easy to move around as needed. The wheels lock to keep the play yard safely in place. Cleaning is easy by using a damp sponge with mild soap. Allow to dry completely before folding and storing away. The Romp & Roost is easily collapsible, and with the handy travel bag with wheels, it makes traveling to your next destination a breeze! According to the American Academy of Pediatrics, infants should sleep in a room with parents until 6 months of age. 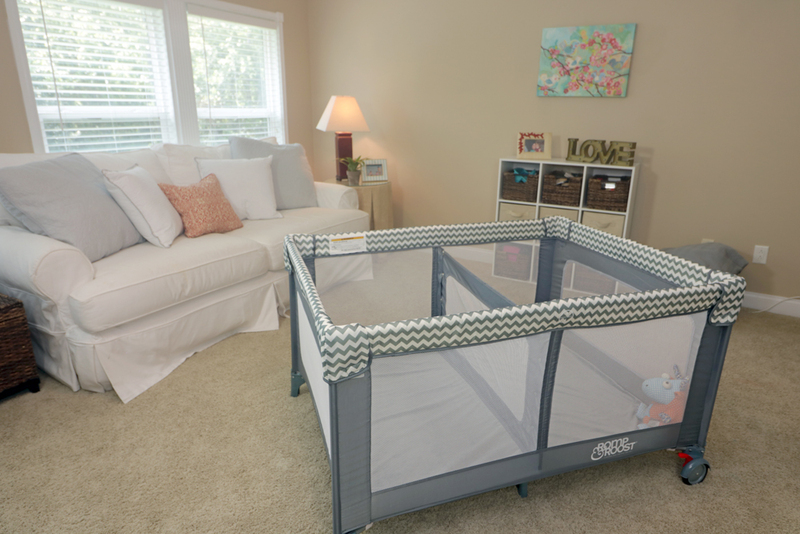 The Romp and Roost is the perfect solution for twins to co-sleep without needing two separate bassinets. We're sorry ... due to excessive shipping cost, this item is only orderable in the Continental United States. International orders are not accepted. Video Opening & Closing 6-11-18 from NESTdesign on Vimeo. IMPORTANT: Before assembling this play yard, please read and understand these instructions. Incorrect assembly or use may make the play yard unsafe. Do not use this play yard if any parts are broken, torn, or missing. Keep these instructions in a safe place for future reference. - Never leave your child unattended. Always keep in view, even when sleeping. - Do not use or leave the play yard near any open fires, electric stoves, gas fires, heaters or barbeques. - Do not place the play yard where your child could reach medication, money, string, plastic, small toys, or other small objects. - Do not place the play yard near electrical cords or outlets. - Do not use any additional mattress or padding. Use only	the mattress supplied with the play yard. - Do not place toys or other objects in the play yard which could provide a steeping stool or foothold to help your child climb out. - Play yard with padded rails should not be used if the covered fabric is torn or bitten through. - Do not use this play yard with a child that can climb out. - Check that the assembly of the play yard is correct and safe. - Always check parts regularly for the tightness of screws,	nuts, fasteners, etc. Tighten as required.